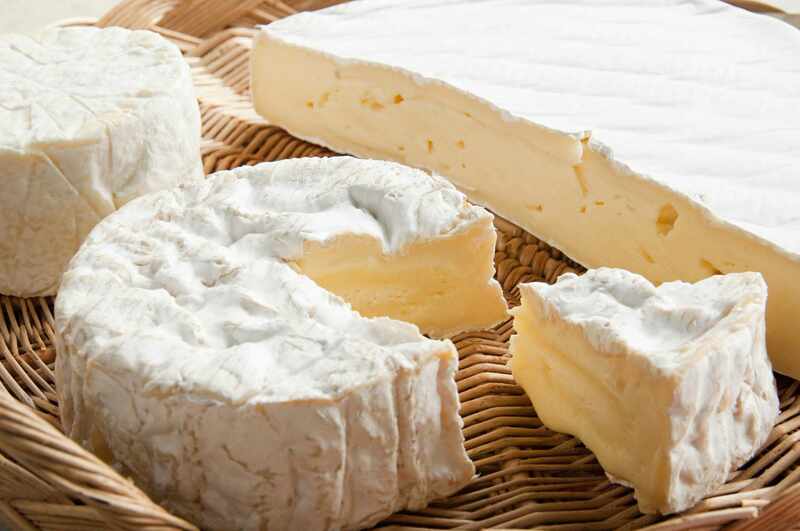 Rinds are the outside shell on cheese that forms during the cheesemaking process. Cheese rinds are natural and usually edible, as opposed to other things that cover cheese, such as wax, cloth, and leaves, that are inedible. Although rinds are edible, the question you need to ask yourself is, do I really want to eat it? If the flavor and texture of the rind enhances the experience of eating the cheese, the answer is yes. Take a little nibble of cheese with the rind and let your taste buds guide you. If a rind does not look or smell appealing to you, or the texture is too hard or chewy, don’t eat it. Bloomy rinds are white and soft, sometimes even fuzzy. Cheesemakers spray a solution containing edible mold spores (Penicillium candidum, camemberti or glaucum) on the cheese. Humidity in the room where the cheese is ripened encourages this mold to grow, or bloom, and form a rind. The only reason you might not want to eat a bloomy rind is if the rind has separated from the cheese somewhat, has a gritty texture, or an ammoniated flavor or smell. Look at the color of the rind. Does it have a noticeably orange or reddish hue? If so, it's probably a washed rind. Brine or alcohol (or both) is washed over these cheeses, creating a damp environment where edible molds, like B.linens, like to grow. Washed rind cheeses are often the most aromatic, or what some people call “stinky cheese.” The flavor of the cheese is typically stronger and saltier, due to the brine and alcohol. Washed rinds are edible, although you might want to avoid the rind if it tastes excessively salty. Natural rinds form with the least amount of intervention. In the temperature and humidity controlled rooms where cheeses are aged, air naturally dries out the outside of cheese. Over time, this forms a thin crust on the outside of the cheese which becomes its rind. Cheesemakers monitor this process and periodically rub the rind with oil, salt and/or a damp cloth soaked in brine. Natural rinds tend to be thicker and harder, and sometimes gritty. For this reason, they aren't always the most pleasant eating experience.